Today I'm sharing another beautiful and easy paper plate craft. These paper plate birds are simply gorgeous. They are also a great art and craft project to make with kids of all ages! This post contains affiliate links. Thank you for your support! I hosted a play date with 5 other children this past summer and wanted to give them a small art activity to do. The kids' ages ranged from 18 months - 4 years old, so the activity had to be simple to set up and easy for all the kids to do. That's when I came up with these paper plate birds! The kids really enjoyed painting them and the activity was so easy to set up the night before. Everyone took home their birds. But we enjoyed the activity so much that we recently painted birds again as a family. 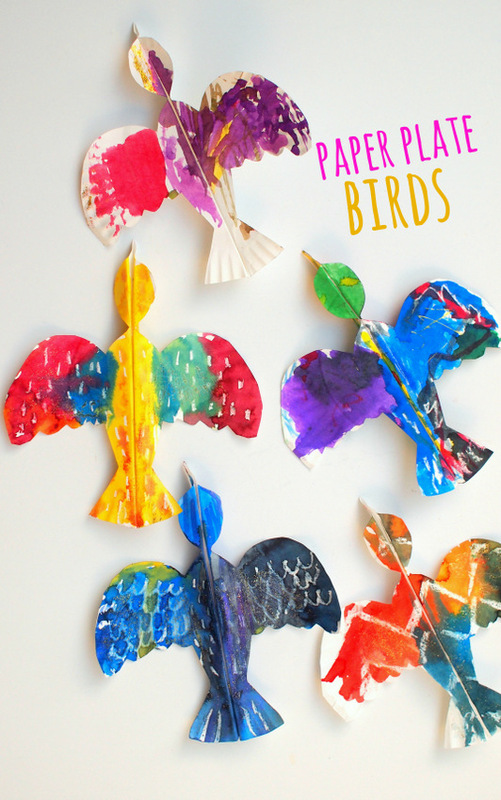 Here's how we made these lovely paper plate birds! Let's Make some Paper Plate Birds! First, I folded a paper plate in half. I traced out half a bird shape. Then, I folded the wings over and stapled the bottom of the bird closed. To get these super vibrant colors, we used our favorite liquid watercolors. Prior to painting some of the birds, we also drew designs on them with yellow and white crayons. These designs were "revealed" when we painted over the birds. My husband saw how much fun we were having that he had to join in too! Here are some birds that he and I painted alongside our son. You can always find more fun ideas on my Pinterest, Facebook, Instagram, or Twitter accounts! (Or subscribe to my email mailing list by filling out the pink bar at the top of the screen. :) Hope you had fun making these! ;) love how you have changed the site up!! How did you get the white "resist" look? Is it white crayon or something? Yup. We drew over everything with white crayon first, then painted. The paint never soaked into the parts that were covered with crayon. My favorite bird book is "Birds" by Kevin Henkes. It has beautiful illustrations and the word imagery is simply lovely. Love your birds, may do them with my kindergarten class. Love that book! Thanks for visiting! Love these wonderful birds. Did them today with my 2 granddaughters ages 4 and 7. I went a step further by getting a 3/4 inch dowel rod and cutting it in half. Then I screwed eye hooks in the ends and attached the birds with a couple feet of string. It was a windy day and they flew out behind them like little kites as they ran around most of the afternoon! I'm so glad you had such fun trying this craft out! Is there a pattern for the bird shape? Thanks! Hi there, fabulous idea! I will be making these with my students as we explore the cultural setting and regions of Costa Rica. I recommend the book, "The Parrot Tico Tango" by Anna Witte. we did this today for our Sabbath School project. We are going through the days of creation and we are on day 5 (we are spending 2 weeks on each day as I teach the 6 and under class). We did fish painted with celery for the previous week. These birds turned out great and the kids loved it (the adults did too.) Thanks.